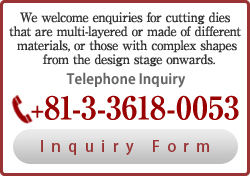 Design of Cutting Dies：Business Overview｜Hara Nukigata Inc. In order to improve the productivity and quality in the design of our cutting dies, we have been using a CAD system since our early days. By using CAD in our production drawings, drawings can be done effectively and copies can be made easily. Producing similar drawings is also easier, and simple mistakes in taking dimensions can be eliminated as the data is all in digital form. By measuring the dimensions and areas during design, not only can we save time and effort in manual calculation, we can also draw the minute sections accurately as the design data can be output to a plotter. Data in the production drawings created by our CAD system can be linked to a computer for design verification, structural analysis and mechanical analysis, and to numerical control (NC) molds and machines for processing. By reviewing the designs in sufficient detail in the early stages, we can drastically reduce the number of defects in the finished products, and produce cutting dies of higher precision.